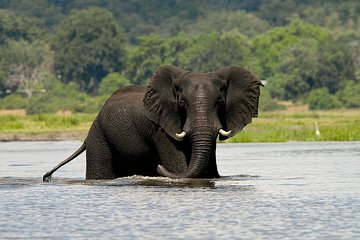 Wenn Sie nur eine kurze Zeit im Chobe National Park verbringen möchten, ist eine Erkundung mit einer geführten Tour der beste Weg dorthin. Diese Tour bietet Ihnen die gesamte Transportlogistik, um Sie bequem von Ihrem Hotel aus über die Grenze zu bringen, und auf eine Safari-Bootstour und eine Pirschfahrt am Nachmittag, damit Sie die Tiere sehen können, die Sie am liebsten sehen möchten. Den ganzen Tag über geben Ihnen Reiseleiter viele Einblicke in die lokale Kultur und Tierwelt und helfen Ihnen dabei, Tiere zu entdecken, die Sie selbst vermissen könnten. My experience at Chobe was fantastic. My only limited qualm was that there were multiple people involved in the process of transport from site to site - that it was hard to tip! I was picked up from the guest lodge where I stayed in Victoria Falls, Zimbabwe, and was transported by 2 awesome gentlemen from the Intondolo Safari and Tour company. We were met at the border by a representative King from a Botswana Safari company Puka, who helped get me through the line at the border, and then escorted me to a van with other passengers who were being split up with other companies. However, I was very impressed as to how well they all worked together. Once we dropped off the few guests going on another tour, we proceeded for about 20 minutes to Chobe. Along the way, we saw plenty of wildlife, including a herd of elephants! We began with the water safari with our boat operator, Brave, on the Chobe River - which was AWESOME! These drivers are so knowledgeable about the wildlife, pointing out many species of birds to us, and showing us things that we probably would not have seen without a guided eye! We were then taken to the Chobe Safari Lodge for an awesome buffet lunch! We were picked up from there by our next guide, who took us into Chobe National Park on a land safari in an open air vehicle. The experience was second to none. If you are thinking about booking this - DO IT! Do not hesitate to book now!